Gina Lollobrigida is an Italian actress. She was very popular in the 1950s and 1960s. She mostly acted in Italian movies. She received a Lifetime Achievement Award from the National Italian American Foundation in 2008. In the mid-1980s, she starred in the television series Falcon Crest. The role was first offered to Sophia Loren, who turned it down. A rivalry with Loren was often reported in the press. Lollobrigida said in a 2015 interview that "Loren and her press agent started this 'rivalry'" and that Lollobrigida was bored of it. In 2013, Lollobrigida sold her jewelry collection through Sotheby's. She donated the nearly $5 million to benefit stem cell therapy. 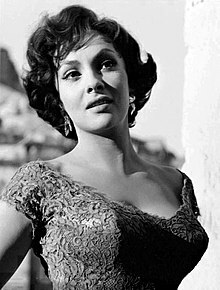 Lollobrigida has won three David di Donatello, two Nastro d'Argento, and six Bambi Awards; she was nominated three times for the Golden Globe and won one in 1961 as World Film Favourite – Female; she was nominated once for a BAFTA. In 1985, she was nominated as an officier of Ordre des Arts et des Lettres by Jack Lang because of her achievements in photography and sculpture. She was awarded the Légion d'honneur by François Mitterrand. On 16 October 1999, Gina Lollobrigida was nominated Goodwill Ambassador of the Food and Agriculture Organization of the United Nations (FAO). ↑ Donadia, Rachel (24 October 2008). "Lifetime Honors Arrive as Life Goes On". New York Times. Retrieved 11 May 2017. ↑ "Questions for WILLIAM SCHMIDT" (PDF). falconcrest.org. 1 March 2006. Retrieved 11 May 2017. ↑ Pukas, Anna (20 September 2014). "Loren and Bardot at 80: A look at the two most beautiful women of their era". Retrieved 11 May 2017. ↑ Demarco, Anthony (15 May 2013). "Gina Lollobrigida's jewels sell for nearly 5m; includes auction record for natural pearl ear pendants". Forbes Magazine. Retrieved 11 May 2017.